The dopamine transporter (also dopamine active transporter, DAT, SLC6A3) is a membrane-spanning protein that pumps the neurotransmitter dopamine out of the synapse back into cytosol, from which other transporters sequester DA and NE into vesicles for later storage and release. Dopamine reuptake via DAT provides the primary mechanism through which dopamine is cleared from synapses, although there may be an exception in the prefrontal cortex, where evidence points to a possibly larger role of the norepinephrine transporter. The initial determination of the membrane topology of DAT was based upon hydrophobic sequence analysis and sequence similarities with the GABA transporter. These methods predicted twelve transmembrane domains (TMD) with a large extracellular loop between the third and fourth TMDs. Further characterization of this protein used proteases, which digest proteins into smaller fragments, and glycosylation, which occurs only on extracellular loops, and largely verified the initial predictions of membrane topology. The exact structure of the transporter was elucidated in 2013 by X-ray crystallography. While transcription factors control which cells express DAT, functional regulation of this protein is largely accomplished by kinases. MAPK, CAMKII, PKA, and PKC can modulate the rate at which the transporter moves dopamine or cause the internalization of DAT. Co-localized TAAR1 is an important regulator of the dopamine transporter that, when activated, phosphorylates DAT through protein kinase A (PKA) and protein kinase C (PKC) signaling. Phosphorylation by either protein kinase can result in DAT internalization (non-competitive reuptake inhibition), but PKC-mediated phosphorylation alone induces reverse transporter function (dopamine efflux). Dopamine autoreceptors also regulate DAT by directly opposing the effect of TAAR1 activation. The human dopamine transporter, hDAT, has a high affinity zinc binding site that, upon binding Zn2+, facilitates amphetamine induced efflux and inhibits reuptake of hDAT substrates. Differences in the functional VNTR have been identified as risk factors for bipolar disorder and ADHD. Data has emerged that suggests there is also an association with stronger withdrawal symptoms from alcoholism, although this is a point of controversy. Interestingly, an allele of the DAT gene with normal protein levels is associated with non-smoking behavior and ease of quitting. Additionally, male adolescents particularly those in high-risk families (ones marked by a disengaged mother and absence of maternal affection) who carry the 10-allele VNTR repeat show a statistically significant affinity for antisocial peers. DAT is also the target of several "DAT-releasers" and “DAT-blockers” including amphetamine and cocaine. These chemicals inhibit the action of DAT and, to a lesser extent, the other monoamine transporters, but their effects are mediated by separate mechanisms. Cocaine blocks DAT by binding directly to the transporter and reducing the rate of transport. In contrast, amphetamine enters the presynaptic neuron directly through the neuronal membrane or through DAT, competing for reuptake with dopamine. Once inside, it binds to TAAR1 or enters synaptic vesicles through VMAT2. When amphetamine binds to TAAR1, it reduces dopamine receptor firing rate and triggers protein kinase A and protein kinase C signaling, resulting in DAT phosphorylation. Phosphorylated DAT then either operates in reverse or withdraws into the presynaptic neuron and ceases transport. When amphetamine enters the synaptic vesicles through VMAT2, dopamine is released into the cytosol. Both of these mechanisms result in less removal of dopamine from the synapse and increased signaling, which is thought to underlie the pleasurable feelings elicited by these substances. ^ Carboni E, Tanda GL, Frau R, Di Chiara G (1990). "Blockade of the noradrenaline carrier increases extracellular dopamine concentrations in the prefrontal cortex: evidence that dopamine is taken up in vivo by noradrenergic terminals". J. Neurochem. 55 (3): 1067–70. ^ a b Vandenbergh DJ, Persico AM, Hawkins AL, Griffin CA, Li X, Jabs EW, Uhl GR (1992). "Human dopamine transporter gene (DAT1) maps to chromosome 5p15.3 and displays a VNTR". Genomics 14 (4): 1104–6. ^ a b Schultz W (1998). "Predictive reward signal of dopamine neurons". J. Neurophysiol. 80 (1): 1–27. ^ Torres GE, Gainetdinov RR, Caron MG (2003). "Plasma membrane monoamine transporters: structure, regulation and function". Nat. Rev. Neurosci. 4 (1): 13–25. ^ Sonders MS, Zhu SJ, Zahniser NR, Kavanaugh MP, Amara SG (1997). "Multiple ionic conductances of the human dopamine transporter: the actions of dopamine and psychostimulants". J. Neurosci. 17 (3): 960–74. ^ a b Wheeler DD, Edwards AM, Chapman BM, Ondo JG (1993). "A model of the sodium dependence of dopamine uptake in rat striatal synaptosomes". Neurochem. Res. 18 (8): 927–936. ^ a b Kilty JE, Lorang D, Amara SG (1991). "Cloning and expression of a cocaine-sensitive rat dopamine transporter". Science 254 (5031): 578–579. ^ Vaughan RA, Kuhar MJ (1996). "Dopamine transporter ligand binding domains. 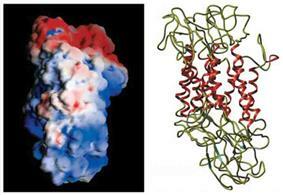 Structural and functional properties revealed by limited proteolysis". J. Biol. Chem. 271 (35): 21672–21680. ^ Penmatsa A, Wang KH, Gouaux E (2013). "X-ray structure of dopamine transporter elucidates antidepressant mechanism". Nature 503 (7474): 85–90. ^ Ciliax BJ, Drash GW, Staley JK, Haber S, Mobley CJ, Miller GW, Mufson EJ, Mash DC, Levey AI (1999). "Immunocytochemical localization of the dopamine transporter in human brain". J. Comp. Neurol. 409 (1): 38–56. ^ Nirenberg MJ, Vaughan RA, Uhl GR, Kuhar MJ, Pickel VM (1996). "The dopamine transporter is localized to dendritic and axonal plasma membranes of nigrostriatal dopaminergic neurons". J. Neurosci. 16 (2): 436–47. ^ Hersch SM, Yi H, Heilman CJ, Edwards RH, Levey AI (1997). "Subcellular localization and molecular topology of the dopamine transporter in the striatum and substantia nigra". J. Comp. Neurol. 388 (2): 211–227. ^ Kawarai T, Kawakami H, Yamamura Y, Nakamura S (1997). "Structure and organization of the gene encoding human dopamine transporter". Gene 195 (1): 11–18. ^ Sano A, Kondoh K, Kakimoto Y, Kondo I (1993). "A 40-nucleotide repeat polymorphism in the human dopamine transporter gene". Hum. Genet. 91 (4): 405–6. ^ Miller GM, Madras BK (2002). "Polymorphisms in the 3'-untranslated region of human and monkey dopamine transporter genes affect reporter gene expression". Mol. Psychiatry 7 (1): 44–55. ^ Sacchetti P, Mitchell TR, Granneman JG, Bannon MJ (2001). "Nurr1 enhances transcription of the human dopamine transporter gene through a novel mechanism". J. Neurochem. 76 (5): 1565–1572. ^ Morón JA, Zakharova I, Ferrer JV, Merrill GA, Hope B, Lafer EM, Lin ZC, Wang JB, Javitch JA, Galli A, Shippenberg TS (2003). "Mitogen-activated protein kinase regulates dopamine transporter surface expression and dopamine transport capacity". J. Neurosci. 23 (24): 8480–8. ^ Underhill SM, Wheeler DS, Li M, Watts SD, Ingram SL, Amara SG (July 2014). "Amphetamine modulates excitatory neurotransmission through endocytosis of the glutamate transporter EAAT3 in dopamine neurons". Neuron 83 (2): 404–416. ^ a b Vaughan RA, Foster JD (September 2013). "Mechanisms of dopamine transporter regulation in normal and disease states". Trends Pharmacol. Sci. 34 (9): 489–496. ^ a b c d e Miller GM (2011). "The emerging role of trace amine-associated receptor 1 in the functional regulation of monoamine transporters and dopaminergic activity". J. Neurochem. 116 (2): 164–176. ^ Pristupa ZB, McConkey F, Liu F, Man HY, Lee FJ, Wang YT, Niznik HB (1998). "Protein kinase-mediated bidirectional trafficking and functional regulation of the human dopamine transporter". Synapse 30 (1): 79–87. ^ Lindemann L, Ebeling M, Kratochwil NA, Bunzow JR, Grandy DK, Hoener MC (2005). "Trace amine-associated receptors form structurally and functionally distinct subfamilies of novel G protein-coupled receptors". Genomics 85 (3): 372–85. ^ Maguire JJ, Parker WA, Foord SM, Bonner TI, Neubig RR, Davenport AP (2009). "International Union of Pharmacology. LXXII. Recommendations for trace amine receptor nomenclature". Pharmacol. Rev. 61 (1): 1–8. ^ Scholze P, Nørregaard L, Singer EA, Freissmuth M, Gether U, Sitte HH (2002). "The role of zinc ions in reverse transport mediated by monoamine transporters". J. Biol. Chem. 277 (24): 21505–13. ^ Gainetdinov RR, Wetsel WC, Jones SR, Levin ED, Jaber M, Caron MG (1999). "Role of serotonin in the paradoxical calming effect of psychostimulants on hyperactivity". Science 283 (5400): 397–401. ^ Greenwood TA, Alexander M, Keck PE, McElroy S, Sadovnick AD, Remick RA, Kelsoe JR (2001). "Evidence for linkage disequilibrium between the dopamine transporter and bipolar disorder". Am. J. Med. Genet. 105 (2): 145–51. ^ Yang B, Chan RC, Jing J, Li T, Sham P, Chen RY (2007). "A meta-analysis of association studies between the 10-repeat allele of a VNTR polymorphism in the 3'-UTR of dopamine transporter gene and attention deficit hyperactivity disorder". Am. J. Med. Genet. B Neuropsychiatr. Genet. 144B (4): 541–550. ^ Sander T, Harms H, Podschus J, Finckh U, Nickel B, Rolfs A, Rommelspacher H, Schmidt LG (1997). "Allelic association of a dopamine transporter gene polymorphism in alcohol dependence with withdrawal seizures or delirium". Biol. Psychiatry 41 (3): 299–304. ^ Ueno S, Nakamura M, Mikami M, Kondoh K, Ishiguro H, Arinami T, Komiyama T, Mitsushio H, Sano A, Tanabe H (1999). "Identification of a novel polymorphism of the human dopamine transporter (DAT1) gene and the significant association with alcoholism". Mol. Psychiatry 4 (6): 552–7. ^ Ueno S (2003). "Genetic polymorphisms of serotonin and dopamine transporters in mental disorders". J. Med. Invest. 50 (1-2): 25–31. ^ Beaver KM, Wright JP, DeLisi M (2008). "Delinquent peer group formation: evidence of a gene x environment correlation". J Genet Psychol 169 (3): 227–44. ^ Laasonen-Balk T, Kuikka J, Viinamäki H, Husso-Saastamoinen M, Lehtonen J, Tiihonen J (1999). "Striatal dopamine transporter density in major depression". Psychopharmacology (Berl.) 144 (3): 282–285. ^ Eiden LE, Weihe E (2011). "VMAT2: a dynamic regulator of brain monoaminergic neuronal function interacting with drugs of abuse". Ann. N. Y. Acad. Sci. 1216: 86–98. ^ Wersinger C, Sidhu A (2003). "Attenuation of dopamine transporter activity by alpha-synuclein". Neurosci. Lett. 340 (3): 189–92. ^ Lee FJ, Liu F, Pristupa ZB, Niznik HB (2001). "Direct binding and functional coupling of alpha-synuclein to the dopamine transporters accelerate dopamine-induced apoptosis". FASEB J. 15 (6): 916–26. ^ Torres GE, Yao WD, Mohn AR, Quan H, Kim KM, Levey AI, Staudinger J, Caron MG (2001). "Functional interaction between monoamine plasma membrane transporters and the synaptic PDZ domain-containing protein PICK1". Neuron 30 (1): 121–34. ^ Carneiro AM, Ingram SL, Beaulieu JM, Sweeney A, Amara SG, Thomas SM, Caron MG, Torres GE (2002). "The multiple LIM domain-containing adaptor protein Hic-5 synaptically colocalizes and interacts with the dopamine transporter". J. Neurosci. 22 (16): 7045–54.